How to setup free Click-to-Call service for your business! Fowiz, a cloud based service provider is offering free 'Click-to-Call' or 'Call Me Back' service, what you need is just an Android phone and a browser. Call-back service is an efficient way to convert website visitors into customers. Visitor submits their contact details, receives a call back from the company within minutes. This article explains how to setup a call-back service for your website free of cost using Fowiz. Step 1: Create an account in Fowiz Cloud. Navigate to Fowiz Cloud and click on 'Don't have an account?'. Choose a username and password, fill-in captcha and click on 'Register'. Activate your account by clicking on the link provided in the email received from Fowiz. Step 2: Install Fowiz Android App on your phone. Open Google Play and search for 'fowiz'. Select the app and click on 'INSTALL' button. You may click on this link and choose to install the app on your selected device. Step 3: Setting up Fowiz Android App. Launch Fowiz app on your device, log in using your username and password. 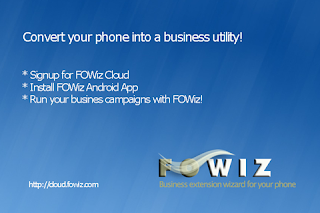 You will receive a popup saying your device is registered on Fowiz Cloud. Now go to 'Settings' and enable call and message notifications. Step 4: Setting up Click2Call. 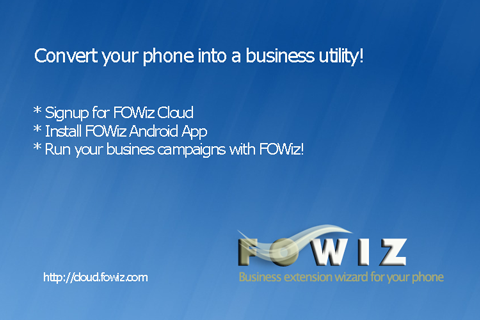 Log into Fowiz Cloud and navigate to Click2Call. Click on 'Options' and fill-in the fields or leave it blank. Step 5: Setting up Click2Call widget on your site. Navigate to 'Settings' and copy the widget code. Paste the code in your website home page. That's it! Visitors of your webpage interested in your product or services may click on the Click2Call link and provide their details. You or your agent gets instant notification on the Click2Call dashboard, now its up to you how you convert the call to sales! Also Fowiz provides an option to initiate the call from within the Click2Call dashboard, with a bluetooth headphone you can manage the calls without touching the phone! Feel free to leave your feedback about Fowiz here. I appreciate from this post thanks for sharing with us. it's seems looking so good.